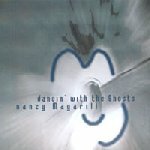 Nancy Magarill’s new album starts with her whispering suggestive lyrics on “It All Comes Down to You”. Then the title track follows with equally clever lyrics and a great melody. Magarill makes beautiful but slightly twisted songs that never go where you expect them to. She has written the sort of songs that don’t stun you on first lisetn ,but creeps up on you when you least expect it. Then they’re impossible to get out of your head. “This Morning I hate you” has a simple guitar line for Magarill to sing over. It sounds like an early Lou Reed song. The main focus for the song is a broken relationship described in a very illuminating way. “Dancin’ with the Ghosts” is an exquisite record.